More three- to five-word book reviews of Christmas gift–worthy books. A few gift-worthy books. Photo by John Hannah. Skipping Christmas, John Grisham, 2001. Canada’s Stonehenge, Gordon R. Freeman, 2009. The Annotated Phantom Tollbooth, Norton Juster, illustrated by Jules Feiffer, 2011. 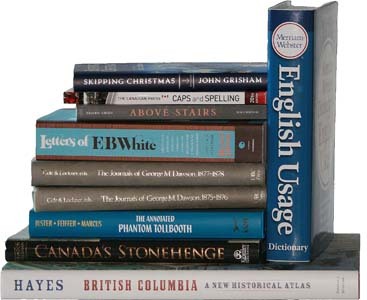 The Canadian Press Caps and Spelling, 20th edition, James McCarten, ed., 2012. British Columbia: A New Historical Atlas, Derek Hayes, 2012. The Journals of George M. Dawson: British Columbia, 1875–1878; Volume I, 1875–1876, Douglas Cole and Bradley Lockner, eds., 1989. The Journals of George M. Dawson: British Columbia, 1875–1878; Volume II, 1877–1878, Douglas Cole and Bradley Lockner, eds., 1989. Above Stairs: Social Life in Upper-Class Victoria 1843–1918, Valerie Green, 2011. Aristocracy. Attitudes. Affectations. Artifice. Aegis. Letters of E.B. White, originally collected and edited by Dorothy Lobrano Guth, revised and updated by Martha White, 2007.